JOIN US for this small group Acoustic Doppler and Water Quality training event brought to you by SonTek and Xylem Water Solutions in Conjunction with ENVCO Global New Zealand. 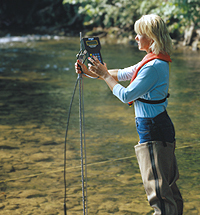 Bring in your system and data for this free, two day acoustic and water quality training event. Key topics of dicussion will be data analysis and GPS. If you are interested in learning flow measurement best practices, this is the workshop for you! Pictured: Lead Instructor Kevin Labbe. Kevin started his work with acoustics in 1996 and throughout his USGS career, was involved with Index Velocity computations. At the end of his tenure with the USGS, he was the database administrator and part of the Central Region Advisory Committee on Data. He began his new career with YSI in 2003, and has travelled extensively in the U.S. in support of both Sontek and YSI products and services.